Selkirkshire councillor Gordon Edgar at the bus shelter in Selkirk's Market Place. Workers are being urged to come back to Selkirk to apply the finishing touches to its town centre revamp after being alerted to lampposts and a bus shelter being left in need of further attention. The centre of the royal burgh has benefited from £2.4m worth of investment thanks to a conservation area regeneration scheme (CARS) and streetscape project, historic buildings having been given a facelift and its marketplace redeveloped. However, Selkirkshire councillor Gordon Edgar has been left disgruntled by the failure of those involved to finish the job satisfactorily. He is unhappy about two large signposts being left with no signage, hanging baskets being abandoned to rot on lampposts, a bus shelter being damaged and the lightning conductor on the side of town hall not being secured. 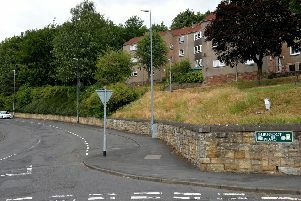 At the latest meeting of Scottish Borders Council’s executive committee, Mr Edgar told officers: “The CARS scheme in Selkirk has been excellent, and the workmanship has been brilliant, but it’s being let down by minor details. “It doesn’t seem to be getting finished. “The lampposts have been all marked and damaged by the works. The bus stop was moved, and it was also scratched and damaged. “It’s not been done. They don’t seem to have finished off the job. Is there any deadline that we can put on the officers? “The flood protection scheme is in the same state. Jo Hogg, the council’s regeneration officer, replied: “The final elements of the streetscape works were due to be finished once the scaffolding had been removed from the courthouse, so I’ll take your point back to the team that is managing the works, but as I understand it, I think it’s just final works that need to be done now. The town’s riverside has also been redeveloped as part of the Selkirk flood scheme. The £31.4m project was completed in February 2017, but benches which were taken away to be renovated have still not been replaced. Speaking after the meeting, Mr Edgar said: “I’ve been in touch with officers constantly. I get promised this and that, and it never gets done. “It’s the same at the riverside flood prevention scheme. “We’ve been told for ages that the benches would be replaced, but I can’t get it done. “It’s not a big thing in the grand scheme of the project, but elderly folk who take a walk down the riverside need to be able to take a seat.